In crossing the finishing line at this year's London Marathon, which was held on Sunday 24th April, Andrew Kolmar of the Rotary Club of Cranleigh bridged a gap of 34 years since he had previously run in the event - and in so doing claimed the record for the longest time between a first and subsequent London Marathon. Andrew’s first London Marathon was in 1982. Although his time of 6 hrs 15 mins was a relatively modest one, he was about half an hour faster than expected. 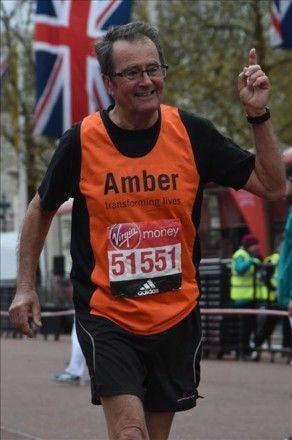 Andrew was running to raise much needed funds for The Amber Foundation, a local charity working hard to rehabilitate young homeless people, typically with a history of substance abuse. He would like to thank all those who have so generously contributed to the £2400 raised so far. Amber is a local charity which exists to help young people who come to them without work, without self-esteem and without any sense of direction, to transform their lives. Almost all are long-term unemployed, homeless or have a history of substance abuse. By the time they leave, the vast majority are ready to lead sustainable independent lives. Donations can still be made at uk.virginmoneygiving.com in the name of Andrew Kolmar. All donations will automatically go to Amber. More information about Amber can be found at https://www.facebook.com/AmberFoundation .